It was our last day on the Island of Tiree and Rhoda was about to take us on an Island Tour in her trusty bright yellow Transit van, Beryl. Just before we left, her cousin popped by to ask us to move the motorhome so that he could drive his cattle out to different grazing. We manoeuvred up into a gateway, deftly avoiding falling into the soak away, and watched fascinated as the great beasts and their calves wandered by, mooing irritably. I have a slightly ambivalent relationship with cows, ever since we were tightly surrounded by a massive herd in a field on the Isle of Cumbrae and found ourselves unable to persuade them to move on – but that’s another story. On this occasion the cows were in good hands and moved on by without even a glance in our direction. Soon we were perched up in Beryl and bouncing down the single-track roads in the safe hands of the very experienced single-track road goer, Rhoda. As a mainlander, accustomed to roads with two directions, shooting round the Island at speed is akin to a visit to Alton Towers. You know that feeling on a roller coaster when you’re convinced that you’re about to hit an oncoming carriage and then it swerves right at the last minute? If so you get the idea about the Islanders on the road. Every single person waved as we shot by and occasionally they stopped to pass the time of day in a mixture of Gaelic and English. The whirlwind tour left us with wonderful images of white sand beaches and blue ocean, the weather changing every few minutes catapulting us from one season to another. We had a fascinating visit to Tiree Glass, where recycled glass is heated, cut and moulded to create beautiful works of art. The most spectacular was a giant marble run made of brightly coloured and mirror glass. On every wall and surface there were beautiful pieces and we couldn’t resist buying one or two before we left. A similar inability to resist came into play at the Tiree Chocolate Shop where Island made chocolate and sweets are laid out in all their tantalising glory. We bought three lots of chocolate for gifts to take home. We’ve already eaten two of them. Sorry folks. There is no hope for the third one. Lunch in the Farmhouse Café was a grand finale to a few hours and we were soon back at the Co-op in Scarinish picking up essentials before shooting back up the road to complete the circuit of the island. So, about the rare bird. There were in fact two rare birds to deserve a mention in today’s post. The first was a funny little, chubby, flecked thing with a long neck that had us all confused. What on earth was it? Later, at the Hynish Lighthouse exhibition we found out – it was a Corncrake! Extremely rare and rather shy, many a birdwatcher has been known to lie in damp fields for hours looking for one. We saw one and had no idea what it was. Ignorance, in this case, is not bliss. The other rare bird who gets the place of honour in this post is our friend Rhoda whose hard work and commitment is truly an inspiration. All the things she has achieved, in the three years since she arrived on the island amazed us. The house is being renovated and will soon become both a lovely home for herself and a fully renovated holiday let in the adjoining larger part of the house. 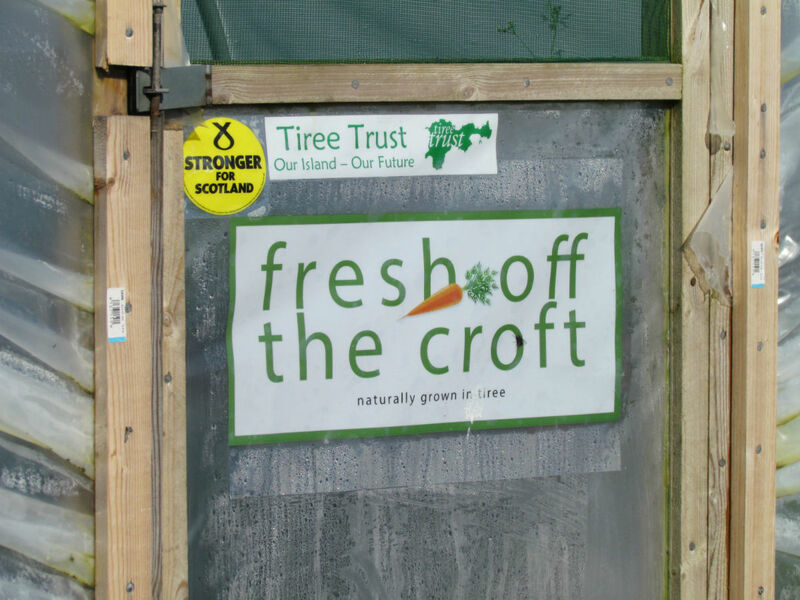 Her business “Fresh off the Croft” produces an incredible array of beautiful vegetables. One evening she delivered a mixed salad to us, just picked from the polytunnels and it was truly divine, as were the eggs provided for our breakfast. On top of all that she holds down full time online work. A rare bird indeed – thanks Rhoda for the true Island hospitality. So, if you want to visit Tiree here is some information you might find useful. Motorhomers are asked not to wild camp but to stay on one of the many crofts that will welcome you. This is because the machair i.e. grassy area beside the roads, is very fragile and vital to the island’s main business of livestock crofting. Fresh water and a facility to dump waste will be available on the croft and there is a chemical loo dump in the village of Scarinish behind the public toilets. Look for the metal upturned pyramid. If you bring ‘green’ toilet fluid, suitable for septic tanks, even better. Currently a night’s stay on a croft is £10. If you don’t have a motorhome then there is plenty of choice of holiday accommodation. We can recommend the, soon to be ready, holiday let at Coll View. We were back on the Clansman ferry on Saturday afternoon, ready for the next part of the adventure and, having filled up with diesel and food in Oban set off north. First stop on the mainland was the beautiful Bunree Caravan Club Site at Onich, just south of Fort William and on the shores of Loch Linnhe. What a shock to the system! Cars and trucks and buses running in two directions at the same time and so many people! The site was nearly full and in the evening sunshine was buzzing with activity. We walked the dogs and had three games of pool before falling into bed exhausted. It must be the sea air – but we’re sleeping like dead things. Next stop Arisaig. See you there!